Share the post "Alumni Story: Jessica Ware (GSNB ’08) – Chasing Dragonflies"
Celebrated in art and literature over the centuries, dragonflies continue to fascinate people, and none more than Jessica Ware (GSNB-Entomology ’08). An assistant professor in the Department of Biological Sciences at the Rutgers-Newark College of Arts and Sciences, Jessica credits her Canadian upbringing for her passion for dragonflies. During her undergraduate years at the University of British Columbia in Vancouver, she had a work-study assignment in the lab of a professor who studies damselflies, an insect in the same order, Odonata, as dragonflies. Very quickly, a summertime fascination turned into a scientific calling. Soon after she arrived on the G.H. Cook campus, she found Michael L. May, now a professor emeritus in the department, whose primary research interest was dragonflies, specifically their systematics, phylogeny and character evolution. “When I saw his work on insect taxonomy with an evolutionary slant, I was hooked,” she said. Dragonflies have been around for more than 300 million years, with some 6,000 species found throughout the world. More than 300 species flourish in North America. They are considered predators – but in a nice kind of way. They have prodigious appetites for mosquitoes and other insects, and their appearance in the height of summer makes them welcome guests. So popular is this insect, that there are clubs, similar to bird-watching societies, devoted to spotting and photographing Odonata. The combined interest in evolution and insects has led Jessica to an important role in an international research initiative on the evolution of insects, called 1KITE (for 1K Insect Transcriptome Evolution). The 1KITE team comprises scientists from Australia, Austria, China, Germany, Greece, Japan, Mexico, The Netherlands, New Zealand and the U.S. They are studying the transcriptomes, or the entirety of expressed genes, of more than 1,000 insect species (hence, 1K) representing all recognized insect orders. Jessica, who was invited to join the collaboration by another Rutgers professor, Karl Kjer of the Department of Ecology, Evolution and Natural Resources of the School, explained the initiative this way: “Insects are diverse, economically and ecologically important organisms. 1KITE will help scientists uncover relationships among these remarkable organisms and tease apart the dates of origin of social behavior, parasitic behaviors, herbivory, flight, and so forth,” unlocking the secrets hidden within insect genomes. 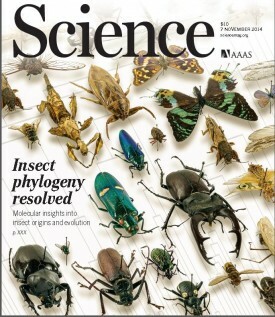 Cover of the Nov. 7 issue of the journal Science features scientists’ mapping of the evolution of insects. 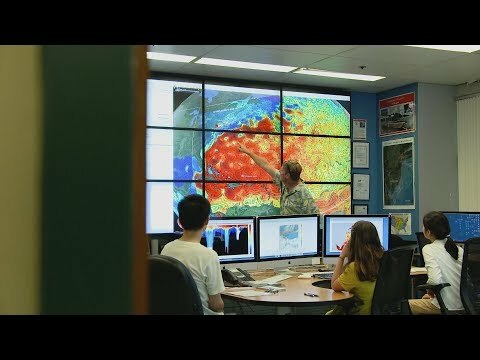 The initial report on their groundbreaking work was the cover story of the Nov. 7, 2014, issue of Science, the world’s largest general science journal, published weekly by the American Association for the Advancement of Science. While dragonflies and damselflies are Jessica’s first love, she also has a strong background in termite studies. After she received her Ph.D. in 2008 she was awarded a National Science Foundation (NSF) post-doctoral scholarship to study the systematics of termites and how social behavior may have developed, work she conducted at the American Museum of Natural History in New York City. 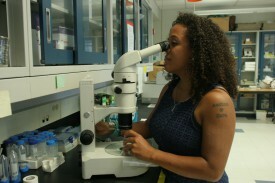 Very recently, she received an $875,000 NSF early CAREER grant “to look at how the social structure of lower-termite colonies might have arisen 140 million years ago, testing whether ecology and dietary shifts led to changes in diversification and morphology,” according to a news report from Rutgers-Newark. Part of this grant allows Jessica to work with high school students in Newark to increase their interest in STEM (science, technology, engineering and mathematics) education and careers. A natural-born teacher, she conducts an “Explore Bugs” class for children ages 5 to 10 at the Cranbury Public Library; she works with high school students through Aim High, a summer research program run by Rutgers, as well as the NJ SEEDS program and Peddie Academy; and she teaches evolution to graduate students at Rutgers-Newark. Reflecting again on her Canadian upbringing, she noted being “bitten by blackflies and mosquitoes in the spring, watching beautiful dragonflies in the summer, and listening to crickets singing in the fall. Winter – well that was just snow,” she laughed.